We live in the Portland area and are on hand to help with anything you may need. 1 full bathroom with a shower and bathtub. The condo includes several amenities to assure your stay is enjoyable. We have Wi-Fi, a flat panel TV with cable and DVD player, a washer and dryer, bamboo floors, corian counters, brand new stainless steel appliances, a fully stocked kitchen, all brand new furniture (Dania), a private parking space, access to the community pool, gas BBQ, and fire pit. We are always willing to work with you to ensure your stay is enjoyable. Please let is know if there is anything else you might need! I stayed in this unit for an extended stay and loved the location. Directly out the door are great views of the river and beautiful bridges. Loved this place and would stay here again! 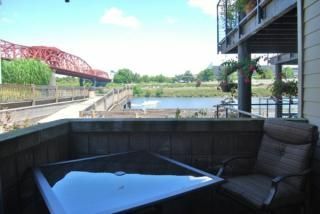 Well located condo on the Willamette River water front. Sadly the view was compromised by the patio’s block retaining wall. The interior was comfortable, but basic. Everything that you might need to enjoy your stay was there. Owners were very accommodating when we inquired about getting the cable fixed. However, a window screen for the master bedroom never materialized. Checking in could have been made easier with current gate codes and parking space numbers provided prior to arrival. The complex is located within walking distance to a number of downtown attractions. However, going south results in an introduction to Portland’s homeless problem in a big way. Overall, it was a pleasant way to avoid Arizona heat. The entire kitchen was not clean. The counter tops, refrigerator, stove, microwave, cabinets & drawers (inside & out) were dirty. The floors were very sticky & we even had a slug in the kitchen! The hide-a-bed was dirty under the cushions. I had informed the owner in advance of our stay that we would have a guest sleeping on the couch, but it was not ready. There is not enough silverware. The vacuum is worthless, the clothes dryer is very noisy especially when both the washer & dryer are running at the same time. There is no storage in the bathroom for our personal items. There is not even a drawer in the sink cabinet & the small cabinet above the toilet is worthless. Another towel bar should be installed. When we entered the condo we immediately called & left a message for the owner. A written reply was received saying that they would refund half of our cleaning deposit and that their cleaning person would come by the next afternoon to clean. She did arrive mid afternoon and did some cleaning....with her own vacuum! The oven was filthy with grease, but she was reluctant to turn on the self-cleaning setting. After she left, I cleaned the oven and the rest of the kitchen and my husband cleaned the windows in the living area. In my opinion this entire unit needs a thorough cleaning! It has been 21 days since we left the condo and we have yet to see a refund of any of our cleaning deposit. Personally, I think the entire amount should be refunded. I'm not holding my breath! In summary, it is obvious that there is a lack of management & communication with this condo. We have been renting from VRBO for many years & have never encountered an experience like this! Obviously, we won't be back to this unit! Wow! I am a full time traveler, with no residence or street address. All my stuff is in storage, including my Prius. But Portland, Oregon is still my home town, with 3 sisters and brothers in law, and a lot of friends, and my mom, who turns 90 in May. So, when I’m not in Italy, Spain, Mexico or Costa Rica, I am in Portland. I’ve lived near PSU, I’ve lived on 23rd Ave, and other good locations in PDX, but I have to admit, this waterfront condo is the best place I’ve lived in in PDX. Portland is one of the coolest cities in the world, but the generous and liberal open mindedness can present some risks to your car and your possessions. In this condo, they have specified parking inside gates that are locked at 11 pm. After 11 you have to go through the gate that has 24 hour security. So I felt very safe, even leaving my bicycle in my car (covered by a sleeping bag) — the security guys are everywhere. And it is a quick walk over the skybridge to the train station and Wilf’s, one of Portland’s classic piano jazz venues. The VRBO pictures are 100% accurate — the accomodations are top notch — and it is well stocked with essentials like paper towels and all the stuff you need to cook and clean. These guys are over the top when it comes to providing stuff you might need. I had a minor scrape and went to the medicine cabinet — it is all there — no need to run to the store. I think I will just stay at this place whenever I’m in my hometown. It is awesome! And the neighbors are friendly and look out for each other. They don’t say this in the ad, but they have on the beach (river beach) fire pits, and there are a lot of stainless steel propane grills situated throughout the property, so you can cook just like you do at home. Can’t say enough good things about this VRBO. Location, five stars. Accomodations, five stars. Communication with the owners, five stars. If you are going to PDX when I’m out of the country, you should book this place. If I am in PDX, I will probably already have it reserved!! We really enjoyed the location and comfort of this property. We were in Portland for three weeks during the holiday season and easily hosted eight family members for several meals. The kitchen was well equipped and plenty of room for our family to enjoy. The owners were very responsive to a couple of minor issues that came up. My husband and I look forward to staying there again. I was in town for work and lived here for about a month. The place was clean and quiet. It was perfect. I accidentally locked myself out one morning and Jessi was really nice about it. Enjoy all that Portland has to offer. Walk to the Saturday Market, attend the River Front festivals, walk to China Town, the Pearl District, or the Rose Garden for concerts and games. Several MAX stations are within walking distance (two blocks) and can take you right to the Rose Gardens, Pioneer Court House Square, the Portland Zoo, Museums, the Expo Center, airport, and cities surrounding Portland.